Working for a social cause, acknowledging issues in society that need urgent attention and can be resolved are the noblest of all vocations. Here is an Akshaya Patra beneficiary who anticipates becoming a social worker from the profound suffering, deep woes and agonies she has endured in life. We noticed the empathy in her eyes when she said with extreme determination that she wanted to become a social worker, giving herself for the welfare of children who cannot study because of hunger. Hesitantly, she told that she is not certain whether she can follow through with her goal, as she does not know whether she will be able to continue her education when she completes 14. We met Nagamma at the schoolyards of Government Higher Primary School, Tarabanahalli. She is a 12- year-old studying in Std V. She hails from an underprivileged economical background. She lives with her parents and two siblings. Her father Mahesha and mother Ratnamma work as labourers at a construction site for a meagre income. Nagamma’s family is one among the 179.6 million people in India who are living below poverty line. They do not have a land of their own and stay in a mud house on government land. The house is thatched and has a tin sheet as door. We were humbled by seeing the deplorable condition of the house. The inside of the house was abysmal. The house had bare minimum utensils, and clothes strewn on a hanging rope. We could imagine the plight during rainy season; they told us that the water enters the house, and leaking roof adds to their woes. Nagamma has two siblings, a sister, Savithri and a brother, Chandrashekar; who studies in standard V and II respectively, in the same school (Government Higher Primary School, Tarabanahalli). Though Savithri is younger than Nagamma, she also studies in Std V with Nagamma. Nagamma had to discontinue schooling to take care of her little brother and had missed a year of school. The three children are beneficiaries of Akshaya Patra. When we asked her, what her favourite hobby is, she told us, ‘reading’ but, she added that she does not get time for reading at home. She has to do innumerable household chores like taking care of her siblings, bringing water from the tap, washing clothes and utensils, preparing dinner among other things. Such a heavy responsibility on such small shoulders was a humbling experience for us. Her teachers are fond of her as she is very intelligent and hardworking. As soon as she reaches home, she does her homework and prepares the dinner before her parents come home from work. Though she likes studying all subjects her favourite subject is Maths since she likes to solve problems. She said, “When I am able to solve the problems correctly, I feel happy.” Her favourite teacher is Latha Miss, Nagamma says that she teaches very well and is ready to explain the mathematical sums a number of times, if required, without losing patience. Nagamma likes to play different games like Kho-kho, throw ball and the like. She has participated in running race competition held at Cluster Level. She wishes that the school has a bigger playground so that she can practice more. 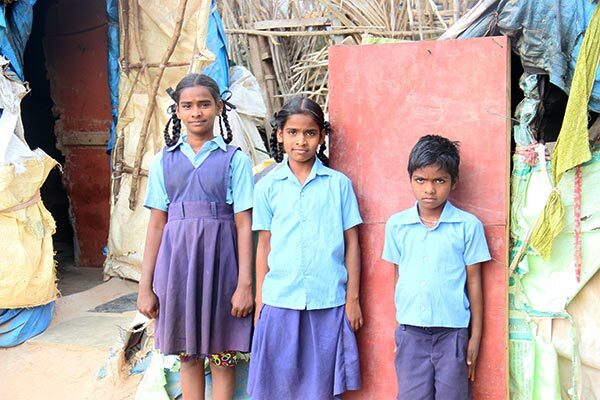 Going to school has become a matter of commitment and enthusiasm for Nagamma and her siblings. At school, they can learn, play with friends, take part in competitions as well as have Akshaya Patra’s nutritious mid-day meals. Nagamma wakes up early in the morning, does household chores, awakens her siblings at 7 am and leaves for school by 8.30 am. Their parents leave for work early in the morning and are happy that the children get a glass of milk every morning as part of their breakfast and the nutritious mid-day meals provided by Akshaya Patra. They also get sweets like kesar baath and kheer on Wednesdays and Saturdays. Speaking of Akshaya Patra mid-day meals, Nagamma became eloquent; she said that her sister and brother both like the nutritious mid-day meals. She said, “I like all the meals served by Akshaya Patra but my all-time favourite is rice and sambar, my brother and sister like pulao. There are a lot of vegetables added in the sambar. I like to eat vegetables as they are rich in protein. It is Akshaya Patra’s mid-day meals that make us healthy and strong.” She added, “The meals provided by Akshaya Patra are very nutritious and they give us the energy to learn and concentrate in class. We do not like to miss even a day of school.” The mid-day meal scheme has addressed classroom hunger as well as malnutrition. It is a boon to many government school children, like Nagamma, Savithri and Chandrashekar to forge ahead and dream big. 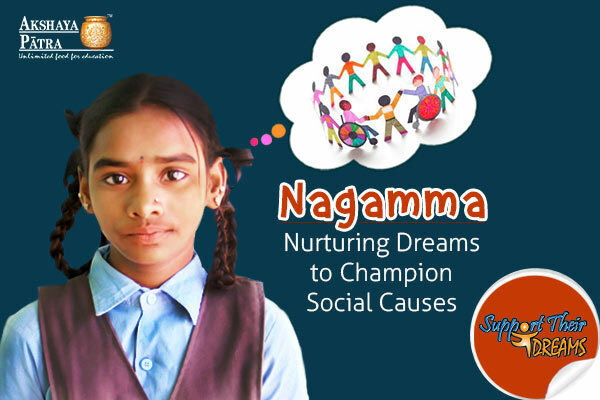 Nagamma’s story of hunger and poverty is the story of many students studying in government schools. The mid-day meals are a source of inspiration for the children to continue their education and unlock their potential in realising their dreams. Nagamma’s words made us realise the extent of insecurity and suffering she is enduring and how poverty is affecting the education of children. When we bade goodbye, we prayed that she may attain heights of success and become the dedicated social worker she aspires to be.